The Best CRM Blog: CRM Tips: How to Bring Your Cold, Dead Leads Back to Life? CRM Tips: How to Bring Your Cold, Dead Leads Back to Life? Reawakening the dead may be the realm of science fiction, but bringing cold prospects back into your sales cycle is very much possible. Over the years, sales and marketing professionals have given utmost priority to warm leads, with a view that they are easy to approach and much of the ground work is already done. But such an approach is very short sighted, dissuading you from harnessing the untapped potential of cold leads. There may be many reasons why your prospects might have gone silent. However, if you spend some time and efforts to investigate ‘why’, you will be surprised at the level of insights that you garner. You can also discover ample amount of opportunities to make them return back to business, as you will learn below. Here are nine steps to reawaken your prospects. Let’s start from the roots. Your business may have many touch-points like website, social platforms, contact centers, P-o-S etc. Where did your lead come from? If he got in touch with you via a web form or an inbound call center, he has a clear need which slates him as a warm prospect. On the other hand, if he responded to your marketing mailers, there may not an explicit urgency, thus raising the probability of him going cold. Identifying the source of your lead will help you to set expectations levels, with regards to conversion rates (as you will see further). How ‘aware’ is the prospect of your business? Unless you follow a (reasonably) regular marketing campaign like mailers etc., your brand will get lost in the haze of competition. Analyze what you do after a lead signs up on your portal. Do you contact him within three hours? Do you regularly send marketing collateral like mailer, one page brochures or conduct events that spreads the word about your awesome product/service? With myriad sales force automation tools available, some built in with cloud CRM solutions, it takes just a few clicks to schedule branding campaigns like mailers, SMS, personal offers etc. No, we are not talking about PhDs or Masters. Qualification here means how relevant your prospect is to your target audience. This assumes more significance, when you selling a niche product/service or you have very specific demographic targeting. To make your task easier, you can set filters for lead acquisition in a web based CRM software. In addition, there are certain giveaways, listed below, that clearly defines a prospect as qualified or unqualified. The prospect visits your business sites regularly (identifiable by IP tracking or comments/feedback). He has filled up the web contact form with clearly define requirements. He contacts you beforehand to inquire about your product/service and ask questions to determine how relevant your offerings are to his needs. He has the required budget and authority (or access to authority) to make purchasing decision. The prospect is receptive enough to schedule a meeting with your sales representative. Checking the qualification levels will save you time, that you can spend in acquiring new prospects. Once you found a qualified prospect, move on to the next step. Qualified lead + fruitful negotiations + (Hefty) Purchase order = sales conversion & commissions. Perfect Utopian dream for sales professional. Sadly, the reality tends to be a bit difficult. Even after the lead is qualified, the conversion rates across industries tend to be low (unless you are Apple). Unwilling to part with money yet and needs more time to research. Once you determine your reasons, take a step back to undertake corrective measures. Every marketer worth his salt know that his profession exists because of ‘needs’, whether inherent or created. If your prospect has no inherent needs, despair not! Send him (scheduled) mailers or flyers that points out the potential loss he is incurring without your product/service. Include statistics, case studies (live one preferably), whitepapers to prove that you are capable of handling the intricacies of his business problems. Offer discounts, value added services to give him maximum ‘bang for the buck’. Over time, the prospect may feel vulnerable to perceived business threats and will rush to declare their interest for you (bringing you closer to that Utopian dream of yours). A well defined follow up strategy will help you in brand retention. Check out this follow-up checklist that guarantees a response. Never forget that convincing a genuine prospect is time consuming. 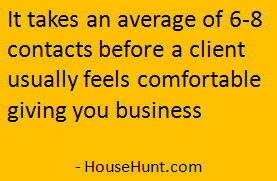 Follow-ups are a great way to stay ‘top of mind’ of your target leads. However, setting up a strategy in your CRM solution is not enough, consistent monitoring is a also mandatory. See if your mailers, industry articles, blog promotions etc. are generating responses. But, take care not to do overt and intrusive follow-ups. It’s okay to do follow ups once every two weeks. Once every three days? NO. And oh, one and done generic mails are passé. Be personal, include the prospect’s name and plug in schemes based on previous interactions. To have maximum impact, prepare a well rounded campaign including your tried and tested methods. In step one, we had mentioned that you need to identify the lead source. Why? Because this step helps to determine at what level of engagement the prospect has right now with your company and accordingly, set your expectations. Do you notice an uptick in activity? Great, you are primed for sales closure. Stagnant or worse, dipping interactions? Adjust your expectations accordingly. Dust yourself up and get back on track by hunting for new prospects. Too many good sales people set high expectations on the wrong leads and end up disappointed, leading to low morale. Avoid this by monitoring engagement levels. When you have the prospect warmed up enough, finish off with a clear call-to-action (CTA). Finalize meetings, discussions with influencers and if hot enough, purchase order dates. Without setting clear expectations, the point of executing the above steps becomes moot. In the end, never give up on your prospects. Keep up the engagement with your Digital CRM. You will be amazed at the added impetus your business derives from (seemingly) cold, dead prospects. Brands listen to our sales CRM blog to get taller, faster!